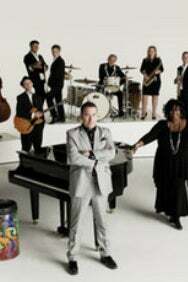 We do not curently have theatre tickets available for Jools Holland & His Rhythm and Blues Orchestra. This could be because we have simply sold out or it could be that this show is no longer running. The information on this page remains purely for historical and informational purposes. Pianist, bandleader, singer, composer, television presenter and multiplatinum recording artist Jools Holland returns to the Royal Albert Hall with his sensational Rhythm & Blues Orchestra. Performing tracks spanning his entire solo career, Jools will be joined by the supremely talented vocalists Ruby Turner and Louise Marshall, as well as original Squeeze member Gilson Lavis on drums with the Rhythm & Blues Orchestra. Jools will be joined by special guest BRIT Award winner Eddi Reader and support acts on both nights. With a catalogue that reaches through decades, Jools’ boogie-woogie party is not to be missed!